I love breakfast. It may be my favorite meal of the day. But I find myself making the same things over and over again (smoothies, oat pancakes, etc., etc.). 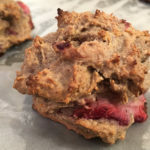 So these strawberry drop biscuits are a nice, simple breakfast alternative to enjoy with coffee or tea. Enjoy them fresh out of the oven or make ahead of time as a grab-and-go breakfast for work days. 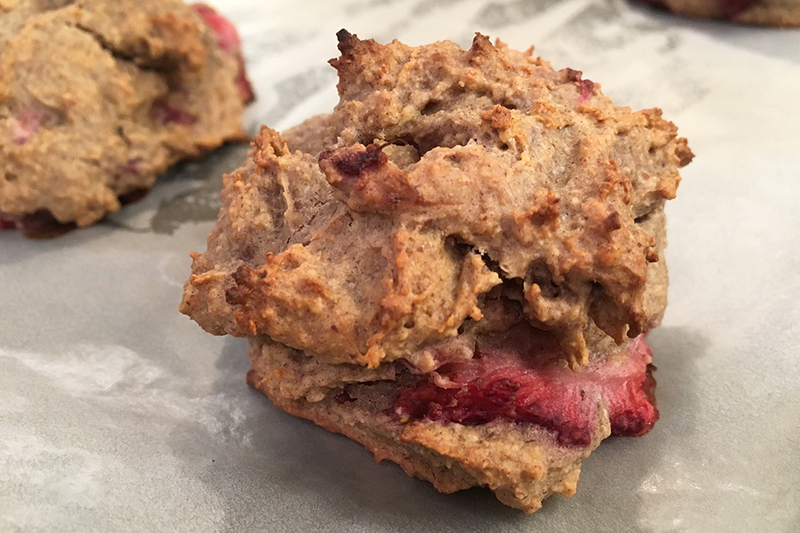 These strawberry drop biscuits are crusty out the outside and soft on the inside. They’re also vegan, gluten-free and super easy to make. They’re not uber-ly sweet so they’re best served warm, topped with maple syrup, agave (vegan options) or honey (non vegan option). I can also picture serving these biscuits with some non-dairy vanilla ice cream as an after-dinner dessert. Next, create your two flax eggs. Add two tablespoons of flax seed to a high speed blender or Vitamix and grind into a fine powder. Place grounds into a small bowl and mix in 5 tablespoons of cold water. Let sit for a couple of minutes. Meanwhile, add oats to blender and grind into a flour. Add baking soda and blend. Melt coconut oil in the microwave in 15 second increments (it doesn’t have to be fully melted – just soft enough to blend well). Now add coconut oil, almond milk, vanilla, pitted Medjool dates and flax eggs to blender and mix well. Lastly, add in the apple cider vinegar and mix. Chop strawberries into bite-sized pieces. If using frozen fruit, defrost first in microwave, then drain excess juice and chop. Fold into batter (I do this with the batter still in the blender, but if you prefer, you can move the batter into a separate bowl). Prepare a baking sheet. Put a piece of parchment paper down and brush with melted coconut oil. Using a large cutlery spoon, drop circles of dough on parchment paper, spaced an inch or two apart. You should have enough batter to make 12 biscuits. Serve warm topped with agave, maple syrup (vegan) or honey (non vegan).